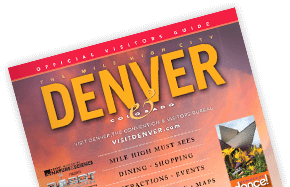 At a cost of $10.50 (with several discounts available), travelers can use the rail service to get from the airport to Denver Union Station and vice versa courtesy of the Regional Transportation District (RTD), metro Denver&apos;s public transit provider. The A Line, which opened on April 22, 2016, whisks travelers from the airport to Denver Union Station in the heart of downtown. The station is the city&apos;s transportation hub and "living room," thanks to its plush surroundings. From Union Station, travelers can access additional local and regional transportation services, such as light rail, regional and local buses, Amtrak rail service, taxis, and the free 16th Street Mall shuttle (MallRide) and free downtown MetroRide buses that provides access to most downtown hotels. Union Station itself is a beautiful 1914 Beaux-Arts building and the location of hip, locally owned restaurants, bars, shops and a boutique hotel. The new Denver airport rail has six stops along the way and takes about 37 minutes. Tickets can be purchased on rail line platforms at ticket vending machines, inside DEN or Union Station, or at any RTD sales outlet. Airport: The location is right by the new Westin Denver International Airport Hotel. Downtown/Union Station: 1701 Wynkoop St.
Download the Denver Union Station Arrival Guide here. Rail vehicles on the A Line have overhead storage, luggage towers and bicycle racks. Travelers must be able to handle their own luggage. Trains have level boarding at all doors of the train and have two wheelchair spaces per car. Right next to the Denver Airport Station is the new Westin Denver International Airport Hotel, which is connected to the airport. Have an early flight or late arrival? No problem, stay right at the airport! The recently remodeled Union Station, located at the other end of the line from the airport, provides easy access to the restaurants, bars, microbreweries, shops and attractions around Lower Downtown (LoDo), Coors Field and the bustling pedestrian 16th Street Mall. Getting from DEN to downtown Denver has never been easier. With the A-Line, Denver's airport rail, it only takes about 37 minutes. Learn more! Want to see the Rocky Mountains without a car? No problem. Get from Denver to the mountains with mountain transportation options like buses, shuttles, and charter services.